The world of today runs on oil – heating and cooling our homes, and powering almost all forms of transportation. Try and drive a car today without oil-based products, and you won’t get far. Without oil, a car engine overheats, pistons and rings fuse to the cylinder walls, the engine block cracks and, of course, there is no gas. You could say oil is the key technology that allowed the automotive world we know today. But that’s all about to change. When it comes to the car of the future and automated driving experiences, however, data is literally the new oil. Data has the potential to radically change the way we think about the driving experience: as consumers, as automakers, as technologists and as citizens of our communities. In fact, as a technologist, one of the trends I see as most disruptive to almost every industry is the enormous flood of data driven by the proliferation of smart, connected devices. Today, we think we live in a world flooded with data, but compared to the future, today’s amount of data is relatively small. In 2016, the average person generates 650MB of data a day – through use of their PCs, mobile phones and wearables. By 2020, projections show that the average person will generate 1.5GB of data a day. That’s an impressive 200 percent increase in less than four years – but it pales in comparison to what we’re about to see in autonomous vehicles. In an autonomous car, we have to factor in cameras, radar, sonar, GPS and LIDAR – components as essential to this new way of driving as pistons, rings and engine blocks. Cameras will generate 20-60 MB/s, radar upwards of 10 kB/s, sonar 10-100 kB/s, GPS will run at 50 kB/s, and LIDAR will range between 10-70 MB/s. 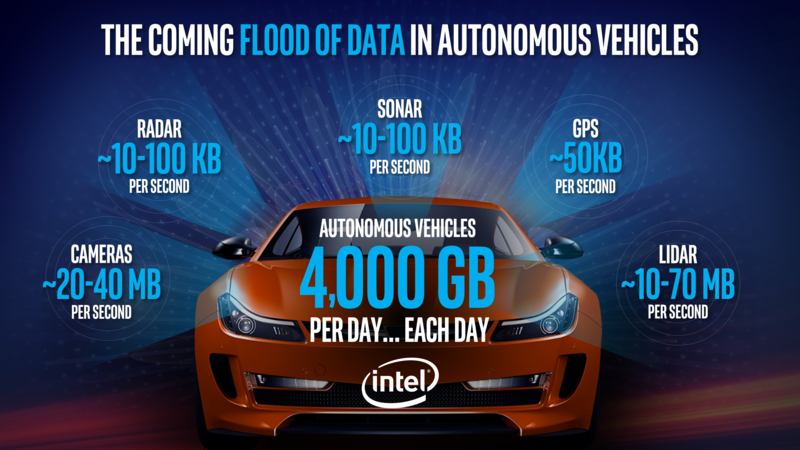 Run those numbers, and each autonomous vehicle will be generating approximately 4,000 GB – or 4 terabytes – of data a day. Every autonomous car will generate the data equivalent of almost 3,000 people. Extrapolate this further and think about how many cars are on the road. Let’s estimate just 1 million autonomous cars worldwide – that means automated driving will be representative of the data of 3 billion people. Just as oil has transformed our world over the last century, data is poised to transform our world for the next hundred years – and beyond. The automotive ecosystem has an incredible opportunity to use data to drive insights, take action on new business opportunities, and even create a safer, less contentious world. Let’s look at three types of data and the value that they will create. The first, and perhaps most obvious, is technical data – or “inside-out” data. This data comes from the car’s sensors that interpret the difference between a child or an animal, a fallen branch or a traffic cone and directs the outward decisions and movements of the car. This data takes an incredible amount of compute power, and whoever has the best data can develop the best artificial intelligence tools of machine learning, deep learning algorithms and data analytics. Second, we’ll see the rise of societal and crowdsourced data – or “outside-in” data. Data from the world around the vehicle, such as traffic, influences how the car gets from point A to point B, and how the car can change course to point C. The Waze app, is a good example of outside-in data today. With this data, whoever has the most data will be able to develop the best applications. Lastly, there is personal data. Data that tracks how many people are in the car, music preferences of each passenger, or even what stores or brands passengers prefer and, when you are near them, tees up sale items. Wearables and other sensors inside the car can also monitor behavior, focus, emotional and biometric status to increase safety and security. Whoever has the most personal data will be able to develop and deliver the best user experience. Data is truly the new currency of the automotive world. It’s not enough just to capture the data. We have to turn the data into an actionable set of insights to get the full value out of it. To do that requires an end-to-end computing solution from the car through the network and to the cloud – and strong connectivity. When it comes to the future of driving, Intel’s commitment to our partners, the industry as a whole and our global society is to accelerate automated driving, deliver end-to-end solutions, and lead the next generation of computing transformations. 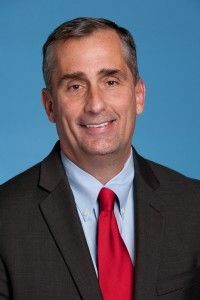 Within our industry, only Intel can make and deliver upon this commitment because of our comprehensive and unparalleled technology portfolio – developed through acquisition and innovation. Going forward, the automotive ecosystem must tackle three challenges when it comes to data: the size of data sets, the intelligence development cycle to process data, and security. And to overcome these challenges, manufacturers and suppliers must achieve scalability – they need a means to collaborate, share and learn without losing their competitive position. Today, I am excited to announce that Intel Capital is targeting more than $250 million of additional new investments over the next two years to make fully autonomous driving a reality. We are committed to providing end-to-end solutions that drive insights and create value from data. Let Intel be your trusted partner as the world moves toward fully automated driving, and together data will improve safety, mobility and efficiency.